Hepatitis C virus (HCV) infected up to 3% of global human population. More than 350 thousand die annually due to liver cirrhosis and hepatocellular carcinoma, developed at the late stages of the disease. The typical ways of HCV transmission are: transfusion of contaminated blood and blood products; sharing syringes among intravenous drug users; use of poorly sterilized medical instruments in certain countries with bad sterilization practice. HCV is hard to identify, at early stages the disease is asymptomatic and progresses slowly. HCV RNA genome is highly variable, and thus interferes developing of a vaccine. 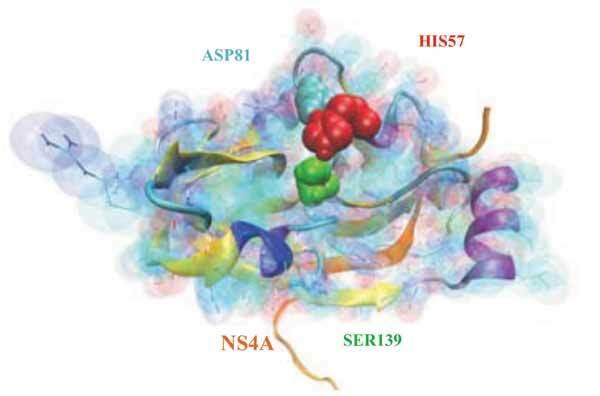 HCV NS3 protease has received close attention as the promising drug target. Recent approval of Boceprevir and Telaprevir, the first inhibitors of HCV NS3 protease, has let increase effectiveness of anti-HCV therapy. Though these new medicines show drawbacks in drug resistance and genotype coverage, second and third generation of HCV protease inhibitors will overcome them. Computational modelling had an impact role in these discoveries. Involvement of modelling in studies for Hepatitis C (HCV) NS3 protease is considered in this review. Hepatitis C, HCV, NS3/4A protease, molecular modelling, computational chemistry.